In order to create Jobs on Jenkins, user needs to sign up on Jenkins. Also, for Jenkins to communicate with the JMeter server present in DevOps setup, JMeter server private key needs to be uploaded to the Jenkins server. Launch Jenkins Master from setup on http://devopshq.shephertz.com. Sign up with Jenkins and fill all the required fields. 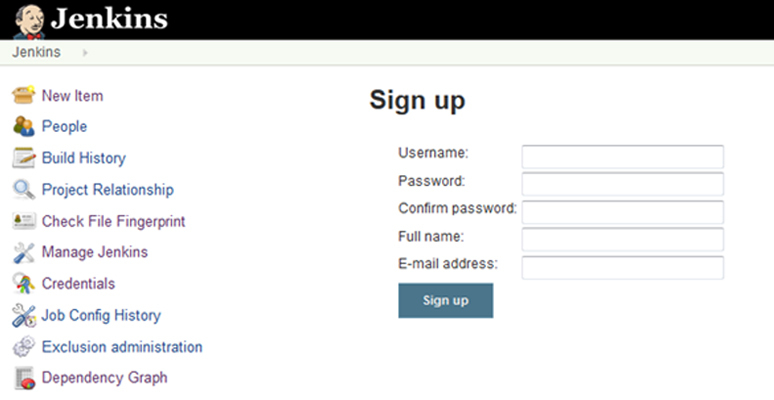 Login to Jenkins using the username and password with which you have signed up. 2.Upload JMeter server private key to Jenkins. Go to Jenkins -> Manage Jenkins. Click on Managed files . Click on Add a new Config . Select the Type as Custom file and click on submit. Enter Name for JMeter private key file, provide the JMeter private key in Content and click on Submit. App42 DevOps uses Jenkins as Continuous Integration tool. 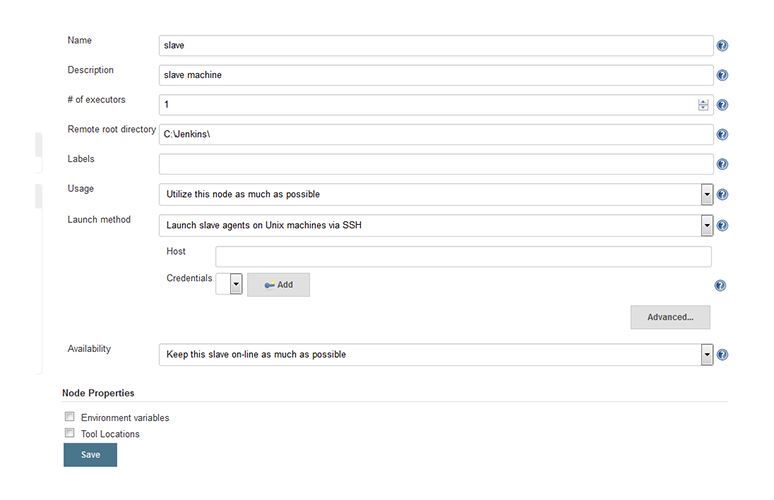 User can create Jenkins Master Slave environment very easily with various modes. 2. Jenkins Master with multiple Slaves. In this scenario, if user has his own Jenkins Slaves which he wants to integrate with DevOps Jenkins Master then user needs to integrate the Slaves manually to the Master node. 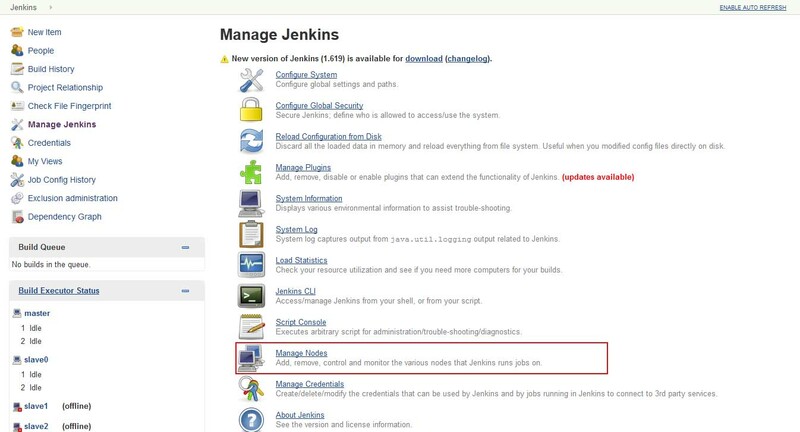 a.On the Master machine, navigate to Manage Jenkins > Manage Nodes . b.Click on New Node . c.Enter the Node name and select as Dumb Slave and click OK .
i.Enter slave machine as description in the Description field. ii.Set number of executors as needed. iii.Set a Remote FS Root, a home directory for the master on the slave machine. v.In Availability, select any option based on requirement . g.Run above command on the slave to attach the Slave to the Master. Make sure to replace the JenkinsMasterIpAddress with Jenkins Master IP address. Go to Jenkins > Job (for which you want to select the Slave). Go to “Restrict where this project can be run” . In this Scenario, the Master Slave configuration is done automatically by App42 DevOps and user does not require to do any manual effort for the Master Slave communication. User can see on Jenkins Slave page that Jenkins Slaves are automatically “Connected via JNLP agent”.